Mahatma Education Society’s (MES) Pillai Group of Institutions conducted a felicitation program for their first batch of 28 students who have successfully completed their SAP Global Certification through SAP University Academy program. 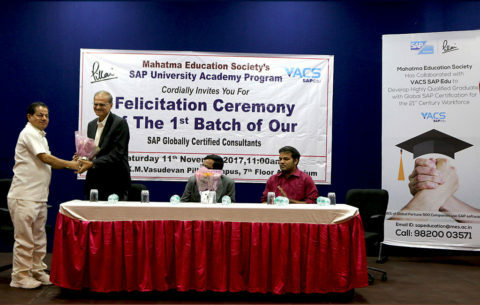 MES is delivering training in SAP through their association with the SAP Education and VACS Technology as their delivery partner. The training is delivered at Pillai College of Engineering Panvel at a reasonable fee enabling students to be ready for the industry and better placements. All the candidates have received premium placements and have begun their career on a strong note. 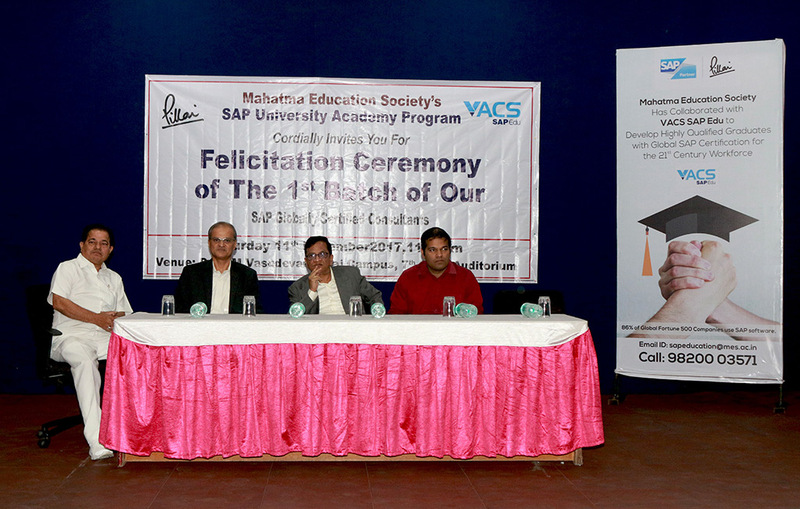 To appreciate them a felicitation function was organised where Mr Vasudevan Pillai, Mr Priam Pillai from the MES management ,Mr Sanjeev Gosavi industry expert along with Mr Vinayak Javadekar Chairman and Managing Director of VACS Technology were present. The speakers spoke about upgrading skills, time management and offering more industry oriented programs through college. The focus was on self-improvement and having an industry connect. 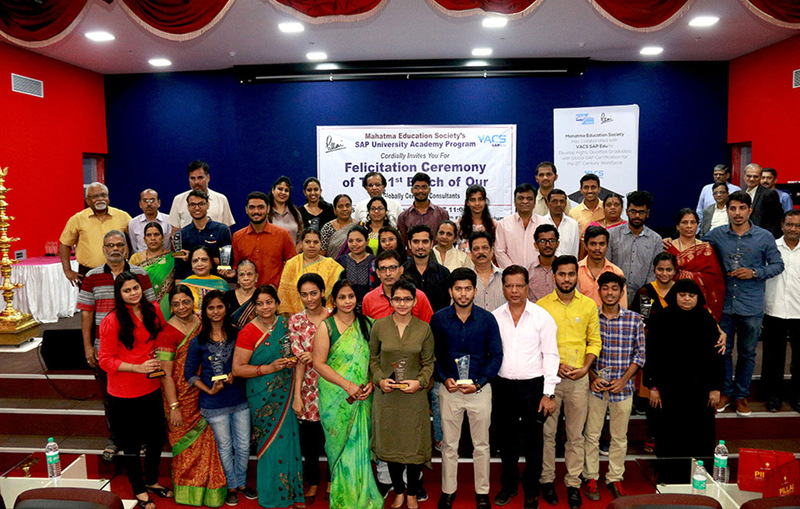 The students along with their parents shared an emotional moment before they embark on their individual careers. MES has been a pioneer in offering industry oriented courses in their institutions improving the placements of the students. 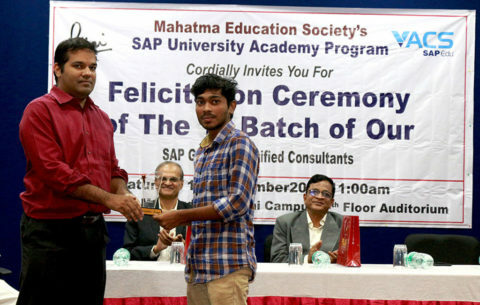 MES is the first institution in Navi Mumbai offering SAP Global Certification. 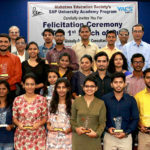 VACS SAP Edu is India’s premier SAP training institute in Mumbai. 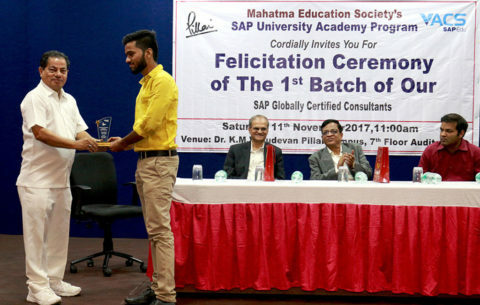 It is backed by a team of experienced SAP Professionals, who have unmatched domain and consulting experience within the industry. 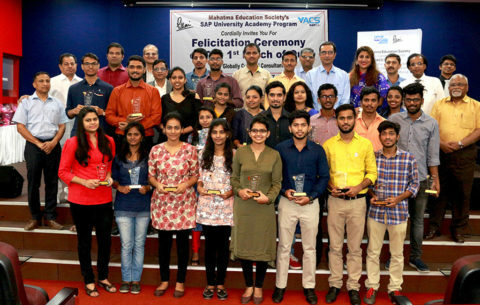 Their dedication has ensured successful and quality based delivery of various SAP engagements to customers across the globe. Wagle Estate, MIDC, Thane - 400604, India.